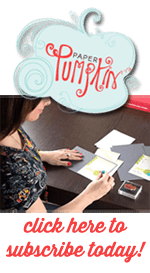 Stampin Up does this to me every year. You think I’d learn by now. Every year they retire In Colors that I have fallen in love with. And now there’s only one more month to get the 2014-16 In Colors. I’m really going to miss this group of colors. I’m not sure which I’m going to miss more: Hello Honey or Blackberry Bliss. Or Mellow Moss. Or Lost Lagoon. Or Tangelo Twist. And to top it off, we’re losing some really cool stamp sets and accessories too. Have you seen the Retirement List? You can see my post here with the list. Or click on the “Going, Going, Gone” link in the right sidebar. This stamp set reminds me of the antique typewriter that my grandmother had. Every time I see a typewriter like this it reminds me of her and the writing that she did. My grandmother wrote travel articles for various magazines about her adventures camping and dune buggy-ing in the Southwest. She was quite the adventurer! This card uses mostly retiring products. The only continuing products are the Whisper White Cardstock, Archival Black Ink, and the gold Wink of Stella. Everything else is going, going, gone. I couldn’t let this set go without using it with some new products though. That gorgeous pink is Sweet Sugarplum and it’s a brand new In Color for 2016-18. The hint of pink paper peeking out is from the Playful Palette Designer Series Paper Stack. Here’s a tip when you decide to use your stapler. Staple the grouping together and then adhere the whole grouping to the card. If you staple everything to the card base, then you’ll see the staples on the inside of the card. I prefer to keep the inside of the card clean and neat. I really do like this stamp set. I might have to hang onto this one!